I did this one because someone searched for “LASIK comic,” and I’m sure they were sadly disappointment that I didn’t have one. Now before you get all over me for not spreading sunshine and lollipops about refractive surgery, let me first clarify that the above comic is comical, I thought. If I was told that my chance of winning the lottery was 99%, then I’d probably play it. If I was told that if I played the lottery that I had a 1% chance of dying then I wouldn’t play it. 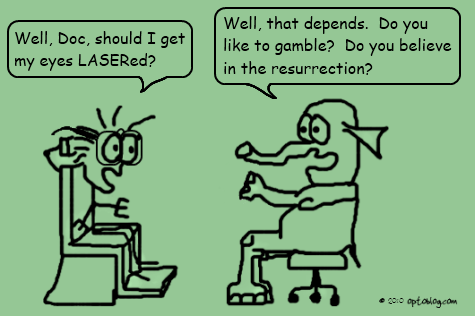 I feel bad that I have to explain the resurrection reference, but I must make sure that those of you who never went to Sunday school understand that in the resurrection, our spirit will be reunited with our bodies which will be in a perfect form (our bodies, not us), so any LASIK disaster that plagued our days in mortality won’t bother our resurrected body. My actual opinion regarding LASIK is pretty main stream. If someone really, really wants it and they have the proper medical prerequisites like cornea thickness, refractive error, good eye health, etc. AND they have a really good understanding of the risks and expectations, then I will recommend them to a good surgeon. Perhaps the surgeon that would do my LASIK if I wanted it. But I don’t want it. I don’t fit the psychological profile since I’m perfectly happy in Night and Day contacts. I’m also rather wary of my family history since I’ve had three close blood relatives get it and most were left still needing glasses or enhancements.